With keen attention to detail, Maggie enjoys maintaining accurate academic records for the Admissions office. Initially joining the Dallas International staff in 2010 as the Director of the International Students Office, Maggie gained experience orchestrating various details regarding international students’ time during their studies. After only one year, she assumed new responsibilities when she became the Director of Admissions. Since then, the Lord has continued to use Maggie’s skills to hone the efficiency of the admissions process, enhancing students’ experience here. Maggie draws on her diverse experiences to serve those with whom she works. Originally from Missouri, she taught middle-school math for seven years in St. Louis. Then, while living in Florida, she spent three years working as a teacher’s assistant helping students with a variety of subjects. Additionally, Maggie tutored for GRE and ACT prep courses during her time in Florida. 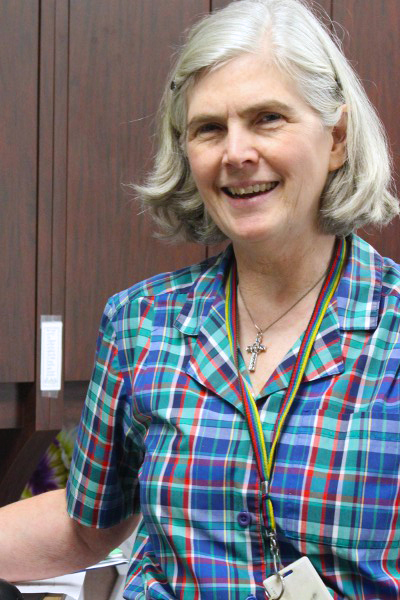 Clearly, because of her educational values and experience in education roles, Maggie’s background has helped equip her to provide students valuable guidance and encouragement during their time at Dallas International. Maggie and her husband have four children and several grandchildren, with whom they spend much of their vacation time. For two years, Maggie served in the Peace Corps in Togo, West Africa. If she could go anywhere, Maggie would like to visit Togo again to see how the country has changed. She would also greatly enjoy taking a trip out West to enjoy the open spaces of states like Montana and North and South Dakota. Maggie enjoys working jigsaw puzzles and reading some British mystery writers. Maggie finds hope in the fact that God fits together the many puzzle pieces of our lives to accomplish His will.